Another 5000 Gallards down, still 5000 more to go to complete my first Iron Mission chain! I swunted a lot more this time around. Very happy with the skill gains. Net loss on the hunt much less than I had thought beforehand. 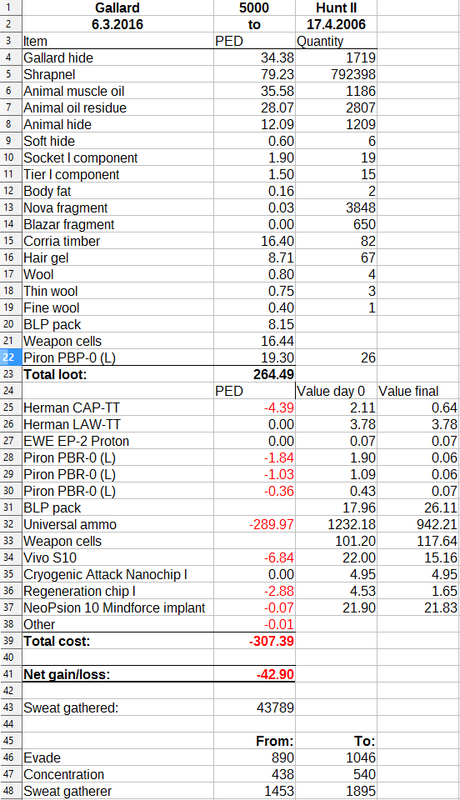 Compared to Hunt I loot was somewhat worse (unfortunately I didn't track expenses in that one so I can't really compare the overall result). I occasionally healed other people with the mindforce chip, so it's not 100% accurate. On a side note, scanning has gotten very frustrating now, barely any skill drops any more. I hit Level 7 Humanoid Investigator with big pains.